If you are using Unified Messaging in Office 365 with an on-premises PBX system – you need to ensure you have a compliant session border controller in place by July of 2018 or face losing voicemail functionality. We provide engineering consulting around making the integration between your on-premises phone system and Unified Messaging via a Sonus Session Border Controller. The Sonus SBC allows both a SIP connection to the on-premises phone system as well as providing an interface on that same SBC to Microsoft O365 using Microsoft’s new preferred method. The interface on the Sonus SBC is called the “Microsoft Skype for Business Cloud Connector Edition software”. 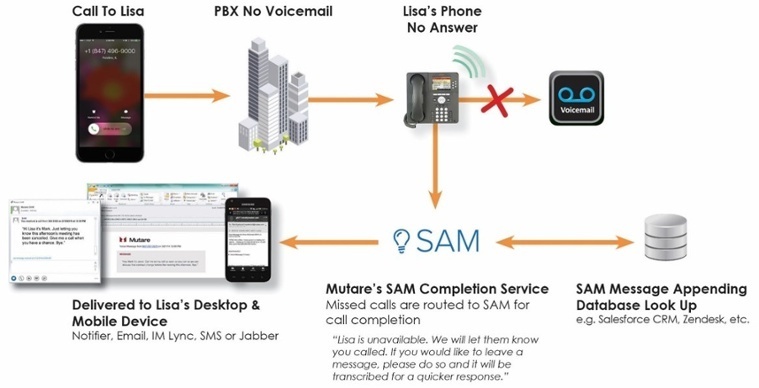 Breakaway from Microsoft Unified Messaging with Mutare Smart Assist (SAM) and eliminate the need for new hardware or Microsoft licensing. Deployed on-premises or in the cloud, you gain true unified call answer capabilities that can deliver calls that go un-answered to SMS, cell phone and instant messaging. You are able to keep your existing on-premises phone system preserving your investment and gain access to all of the features of Microsoft Unified Messaging and additional ones you’re not getting today.